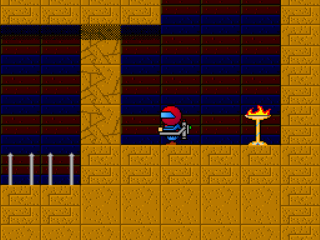 Dark Caves 2: Lost in Egypt is the sequel to Dark Caves, which is based on an old Commodore 64 game. This game plays identically to its predecessor. This time you are above ground, using your jetpack and bombs to make your way through Egyptian-themed catacombs and collect more treasures. Any points this game might have lost for being so similar to the original Dark Caves are easily recovered by slightly but noticeably improved graphics and added polish overall. If you're looking for a fun, simple but polished platform action game, you can't really go wrong with Dark Caves 2 and the first Dark Caves. Nobody has shared their opinion about Dark Caves 2 yet. Be the first. Recommendations: The 3 people who like Dark Caves 2 also like the following games. that this game needs improving ON. This game was decent, but could've been great if the author had actually made improvements over #1. It's just the same game with different sprites and levels- there's nothing new, and none of the errors were fixed. I've clocked Darkcaves , Darkcaves II and Littlebob! Don't waste your jetpack though if you do you'll be stuck!!! Well done, again, Hallbound. But was it just me or the faulty programming, but I never got killed by the chainsaw-type things. Did you mean to make them that way? I actually tried killing my self by walking into one but I couldn't do it! this is stupid i cant pass the last level. Again,one of the best games of gamemaker! Congratulations,your game is very fun! It's pretty fun, and the graphics are nice. I don't have enough patience to play through the entire game, but what I did play was enjoyable. Hola. Me llamo es Baconman. Buenas Tardes. That will prove whether you're truly to be called EL grandeza. Sorry. I've been taking spanish classes.